This salad is bursting with green goodness: a mix of turmeric, chia seeds, apple cider vinegar, grapefruit and vegetables. 1. Pre-heat the oven to 180°C. 2. Put the carrots onto a baking tray and drizzle with the oil and turmeric and put into the oven for 10 minutes. Then add the asparagus and cook for a further 10 minutes and remove from the oven when soft. 3. Soak the chia seeds in the grapefruit juice and cook the lentils according to the packet instructions – this should take about 20 minutes. When they finish cooking and have absorbed all the water, add the soaked chia seeds and grapefruit juice and continue cooking until the rest of the grapefruit juice is absorbed – this should take around 3-4 minutes. Remove from the heat. 4. Make the dressing by putting all the ingredients into a cup and whisking together until completely smooth. Mix the dressing into the lentil mixture and stir through the chopped broccoli and spring onions. 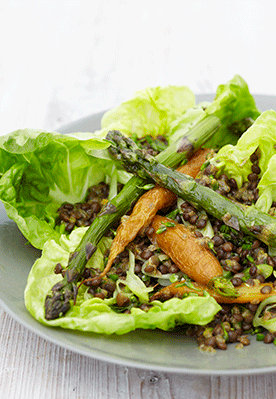 Serve over a bed of lettuce with the asparagus and carrots over the top and garnish with parsley.